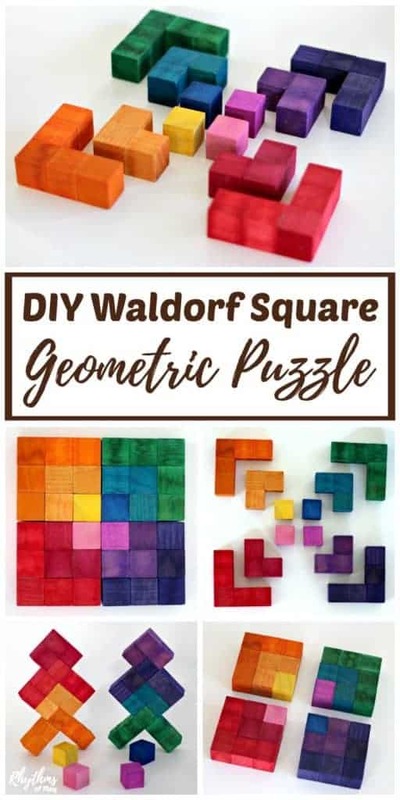 Make a Waldorf Square Geometric Puzzle! An easy DIY toy for kids made with wooden blocks and liquid watercolor paints. Children can exercise their geometric and spatial thinking while tinkering with this 3D wooden puzzle. Use it as a wooden square puzzle or rainbow colored building blocks. Many variations of shapes, colors, and patterns are possible. This square geometrical puzzle was inspired by Grimm’s Waldorf Square. It was designed to encourage 3-dimensional thinking and inner flexibility. The perfect STEAM toy to leave out on tables and desks to invite creative play. I used some of the Sargent and some of the Sax Liquid watercolors to make this 3D wooden square puzzle. I provide an explanation of how to color the blocks and a color comparison of two brands of liquid watercolors in DIY Rainbow Colored Wooden Blocks. You can mix and dilute liquid watercolors or food coloring to make any color you would like to use. Make sure they are completely dry before moving on to the next step. This project used the color combinations shown in the photo below. 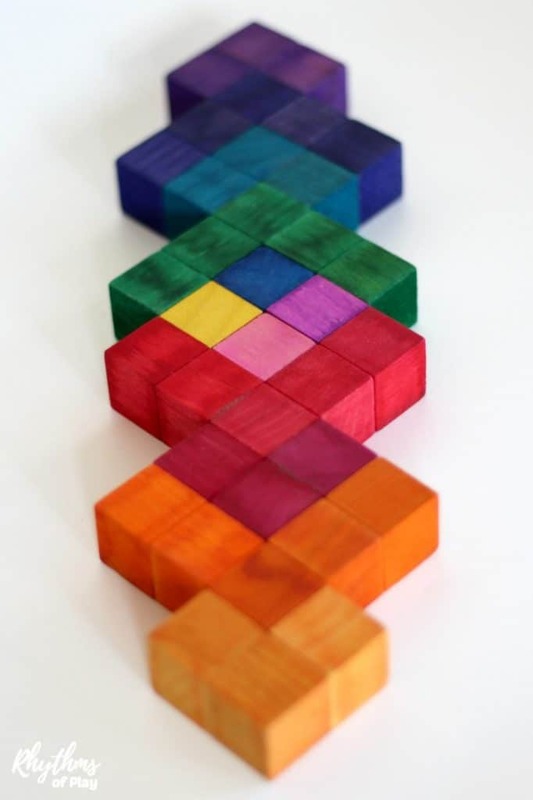 Step 2 – Glue the wooden blocks together into the 3D wooden shapes shown in the photo above. Each photo contains a square, and these 4 squares work together to make the Waldorf square. I recommend using craft glue instead of a glue gun for this DIY wooden square puzzle. Using a glue gun makes it difficult to line the blocks up correctly to make them tight fitting and flush because the glue dries too quickly. That’s all you need to do. Pretty simple, right!? 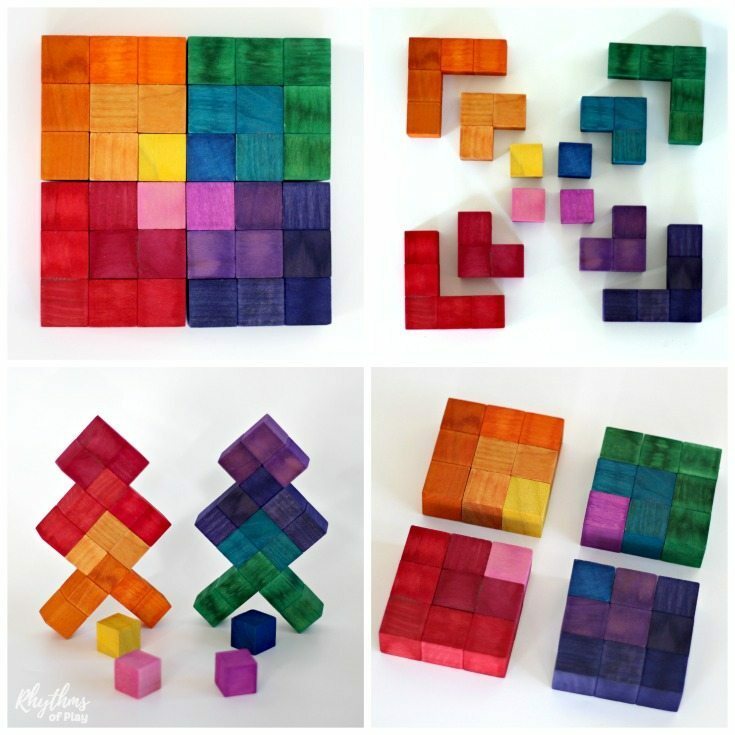 This square 3d wooden puzzle is super easy to make, and provides hours of puzzling fun! Once finished this wooden square puzzle makes a great gift idea for both kids and adults. A 3d wooden square puzzle is the perfect STEAM toy for school and homeschool rooms, coffee tables, and desks. Make a DIY wooden puzzle today! 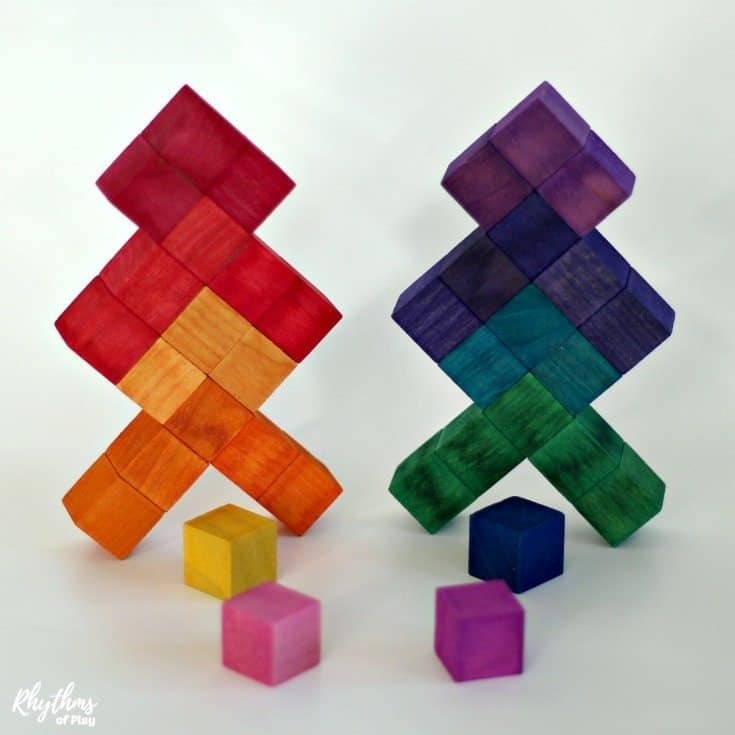 Make even more creative play opportunities for your children with these homemade rainbow peg dolls and homemade rainbow wooden blocksf. Don’t forget to check out our ultimate ultimate family gift guide for lots more DIY and ready-made gift ideas for the whole family! Such a great idea! This is budget friendly and something I’m going to do for Christmas gifts for all the kids. Thank you! You’re welcome! I’m so glad that you like it and will be using it to make gifts for your kids. Hearing that makes doing this more than worth the while. 🙂 I hope they enjoy it… mine does!